Learn geography and world facts by coloring the globe with this illustrated backpack. Maybe your little one hasn't been to Machu Picchu or the Taj Mahal yet, but they can get a peek at the wonders of the world as they travel. (Even if they're just trekking to a play date.) 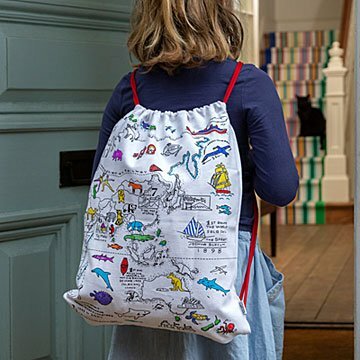 This 100% cotton drawstring backpack is illustrated with hand-drawn countries, landmarks, and animals from around the globe. It even includes fun facts. (Did you know the first solo hot air balloon flight around the world wasn't until 2002?) Since it comes with ten washable markers, kiddos can color the map and experiment by adding their own drawings and designs. Wash the bag in warm water and the ink completely disappears, so your tiny traveler can create their own colorful art again and again. Made in India.